It's July 3 and I'M NOT AT WORK!!!! Yeah!! I decided last night to sleep in this morning since I don't have to be at work .... that plan seems to never work out .... I always wake up at the regular time (even without my alarm set), and can't go back to sleep; however, one advantage of being off is that I can ALWAYS go take a short "power nap" anytime during the day. I bought my little six pack of Starbucks Mocha Frappacino at the store last night, so I've had my shot of energy, my bowl of Cherrios, and my meds and I'M READY TO GO!! I had been working on this card since Susan told me about the Vintage Picnic set from Papertrey and that it would be a must have!! I checked into it and sure enough she was right!! I colored the plaid with fine tip Sharpies and handles and flag pole with Sakura Glaze pens in grey metalic. The stars were done with the Glaze gold metalic. 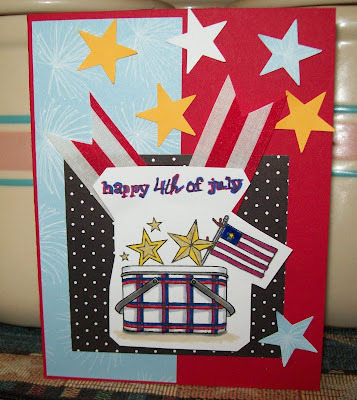 I hope you enjoy the card and that you have a great JULY 4th!! SO CUTE! i can't wait to borrow that set! the girls are making fourth of july t-shirts today, with fabric paint and sponges and a star as a stencil. we're having a good time! very cute card, mom! happy fourth and i hope you get to take a peek outside at some fireworks! God Bless America! I am the proud mother of three wonderful daughters (Susan, and the twins, Nancy and Sara) and "Grandma" to seven GRANDkids (5 girls and 2 boys). I have been stamping about 5 years now...click here to read more about me! This blog has been "Tweaked and Designed" by Sara Williams.